Republican (Term Expires: 2020) serving Dauphin (part) and Perry Counties. John DiSanto is a second-generation family business owner with broad experience in construction and real estate development. He is a managing trustee of the Terra Trust, a real estate development and investment trust that owns and operates a multi-state portfolio of properties as well as construction and property management service providers. 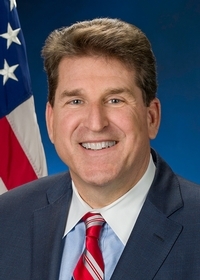 In 2016, John was elected to the Senate representing the 15th Senatorial District, which covers most of Dauphin County and all of Perry County. His agenda includes reforming government, cutting wasteful spending, eliminating property taxes and removing bureaucratic barriers to job creation. John has been instrumental in many large-scale philanthropic initiatives, including construction of the new Bishop McDevitt High School and both building and rehabilitating homes for Habitat for Humanity. He has actively supported educational programs, youth athletics and many other charitable causes that strengthen our communities. Born and raised in the Harrisburg area, John graduated from Central Dauphin High School and earned a Bachelor's Degree in Business Administration with a focus on Urban Planning from American University. He and his wife, Maria, have two grown children.